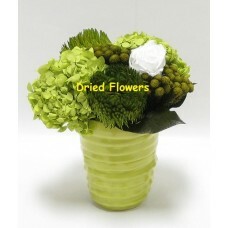 Preserved Green Banksia, Yellow Brunia & Hydrangea natural materials. They offer a lasting alternative to artificial silks. Preserved Green Banksia, Yellow Brunia & Hydrangea natural materials. They offer a lasting alter..